Brazil’s Ministry of Defence on 1 December authorised the navy to begin efforts to purchase the UK Royal Navy’s HMS Ocean landing platform helicopter (LPH). The Brazilian Navy requested this authorisation in early 2017 after a decision to retire its NAe São Paulo aircraft carrier, and after the Royal Navy said the LPH could be available for sale once decommissioned in March 2018. Ocean would be inspected by Brazilian Navy officers before that, while authorisation from the US government is also being requested as the ship has some US-built components. The Brazilian Navy is seeking to commission the UK Royal Navy’s HMS Ocean landing platform helicopter (LPH) by June 2018, the navy told Jane’s on 6 December. The navy is authorised to negotiate with the United Kingdom towards a GBP84.6 million (USD113 million) procurement. Prior to receiving the ship, maintenance and training activities would be done in the United Kingdom. The 22,000-tonne Ocean , in Brazilian service, could host the navy’s Super Cougar, Super Puma, Super Lynx, and Sea Hawk naval helicopters. Transfer of the LPH’s three Raytheon Mk 15 Phalanx Block 1B close-in weapon systems is not part of the deal, the navy said. HMS Ocean, the Royal Navy’s Fleet Flagship, has sailed from Portsmouth Naval Base for the last time before she decommissions from the Royal Navy. The helicopter carrier and assault ship arrived last Friday to pay a brief farewell visit to the city before returning to her homeport of Devonport, Plymouth for the final time under a white ensign later this month. HMS Ocean has delivered 20 years of service to the nation. She has helped to evacuate British nationals and other entitled personnel from numerous areas of conflict around the world and delivered humanitarian assistance and disaster relief to thousands in need to name but a few of her operational highlights. One of HMS Ocean’s final operations mirrored that of her first; the role of Humanitarian Assistance and Disaster Relief. In early 1999 HMS Ocean was deployed at short notice to render assistance to Honduras and Nicaragua in the aftermath of Hurricane Mitch. Some 18 years later she did the same across four separate island chains in the Caribbean as part of Operation Ruman. “HMNB Portsmouth was extremely proud to welcome the Royal Navy’s Fleet Flagship today – as a stalwart of operations in the Service for two decades,” said Captain Bill Oliphant, Captain of Portsmouth Naval Base. “It was extremely poignant to see her berthed by our new aircraft carrier HMS Queen Elizabeth and making way for a new class of capability. HMS Ocean’s role as a highly capable amphibious ship has allowed her to make a significant contribution to UK operations over the years; she often hosted Royal Marines Commandos, helicopters from the Fleet Air Arm, the Army Air Corps and the Royal Air Force, as well as marines, soldiers and myriad of aircraft types from other nations. Tallied up, the ship has spent 11 of the last 16 months deployed on operations overseas during which time she has covered almost 50000 miles. Less than 20 years old and going for about AU$150. The Ministry of Defence is selling the Royal Navy’s flagship vessel HMS Ocean to help plug a mammoth financial black hole. The £84 million sale to the Brazilian navy is due to go ahead next month and Ocean will sail to South America in the summer. Pressed on the amount of money that would be reinvested from the sale, an MoD spokesman confirmed it expected to yield a £55 million net profit, all of which would be pumped back into naval coffers. In its report published last month, the National Audit Office said that despite building in a £6 billion contingency, there was an “affordability gap” of at least £4.9 billion in the MoD’s equipment programme. However if all the risks of cost growth associated with the programme were to materialise the shortfall would rise to £20.8 billion, it said. HMS Ocean returned to Devonport in Plymouth in December following its final foreign deployment, which included assisting with the humanitarian efforts in the Caribbean following Hurricane Irma. 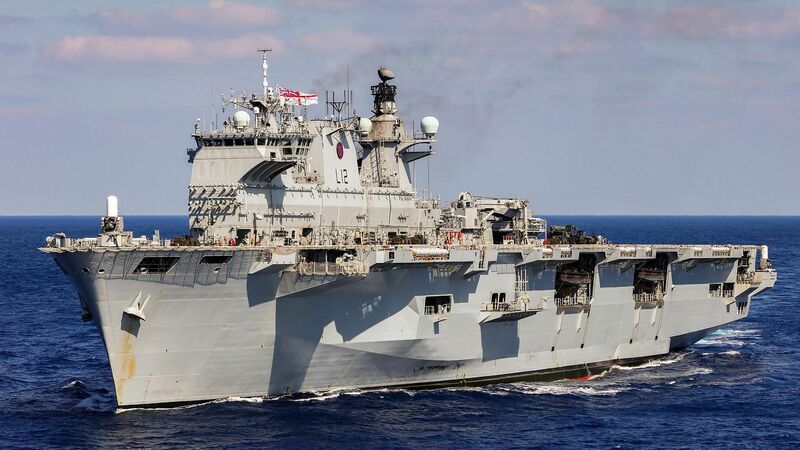 Announcing the sale of HMS Ocean, Clive Walker, head of the Defence Equipment Sales Authority which managed the deal, said: “We have a proven track record of supplying surplus defence equipment on a government-to-government basis. Modifications to HMS Ocean will be made by UK companies Babcock and BAE Systems, funded by Brazil, ahead of its transfer, the MoD said. It is understood the vessel will become a fully operational member of the fleet, rather than being used for display purposes. HMS Queen Elizabeth will eventually take on the role as the nation’s new flagship, and will be able to act as a helicopter carrier once its sea trials have been completed. 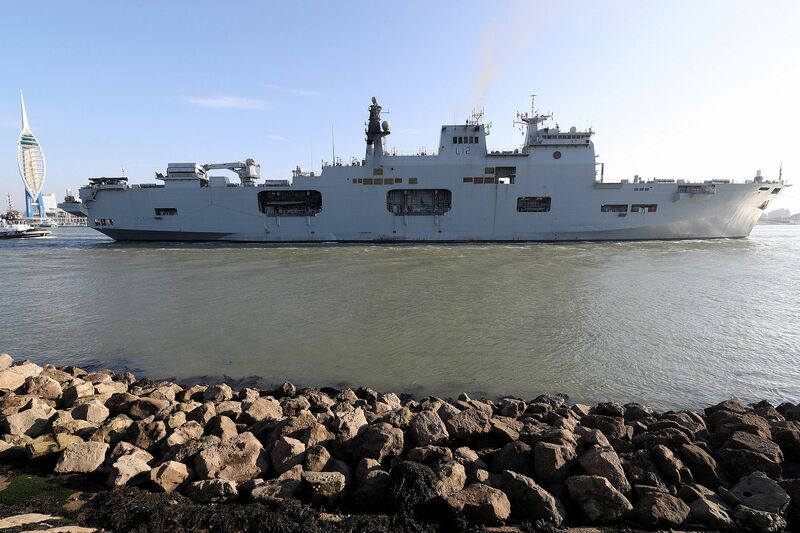 The MoD spokesman said HMS Ocean’s helicopter-carrying capability would not be lost, with the likes of HMS Bulwark and HMS Albion able to take over those duties. Johnny Mercer, the Tory MP for Plymouth Moor View and a former Army officer and Afghanistan veteran, said HMS Ocean’s sale marked ” a sad day”. The amphibious warfare craft was host to Theresa May’s first visit on board a Royal Navy ship in December 2016, and five years earlier members of its aviation crew became unlikely internet sensations after their rendition of Mariah Carey’s All I Want For Christmas Is You went viral. The Brazilian Navy commissioned the multi-purpose helicopter carrier PHM Atlantico (A140) on 29 June in the United Kingdom. The ship, formerly the UK Royal Navy's HMS Ocean (L12), was purchased by the Brazilian Navy through a BRL381.081 million (USD98.76 million) deal on 19 February. HMS Ocean was commissioned in September 1998 and decommissioned on 27 March at HM Naval Base Devonport in Plymouth. In the Royal Navy the ship will be replaced by the Queen Elizabeth-class aircraft carrier HMS Prince of Wales (R 09). The helicopter carrier package for Brazil includes an Artisan 3D search radar, KH1007 surface surveillance radar system, four 30 mm DS30M Mk 2 remote weapon systems and four Mk 5B landing craft. However, the three original 20 mm Mk 15 Block 1B Phalanx close-in weapon systems, the torpedo defence systems and 7.62 mm M134 machine guns were removed from the ship before its transfer to Brazil. The ship displaces 21.578 tonnes, is 203.43 m long and has a range of 8,000 n miles. It has been undergoing maintenance work by Babcock and BAE Systems since February. Scheduled to reach its homeport, Arsenal do Rio de Janeiro (AMRJ), on 25 August, PHM Atlantico will undergo operational sea training under the Royal Navy’s Flag Officer Sea Training (FOST) programme. Wow. Could they have painted the pennant number any bigger?